The Debounce operator filters out items emitted by the source Observable that are rapidly followed by another emitted item. RxGroovy implements this operator as throttleWithTimeout and debounce. Note that the last item emitted by the source Observable will be emitted in turn by this operator even if the source Observable’s onCompleted notification is issued within the time window you specify since that item’s emission. That is to say: an onCompleted notification will not trigger a throttle. One variant of throtleWithTimeout/debounce (two names for the same operator variant) throttles at a periodic time interval that you choose by passing in a TimeUnit and a quantity of such units as parameters to the operator. This variant operates by default on the computation Scheduler, but you can optionally pass in a Scheduler of your choosing as a third parameter. There ia also a variant of debounce (that does not have a throttleWithTimeout alias) that throttles the source Observable by applying a function to each item it emits, this function generating an Observable. If the source Observable emits another item before this newly-generated Observable terminates, debounce will suppress the item. This variant of debounce does not by default operate on any particular Scheduler. RxJava implements this operator as throttleWithTimeout and debounce. The first variant — called either debounce or throttleWithTimeout — accepts as its parameter a duration, defined as an integer number of milliseconds, and it suppresses any emitted items that are followed by other emitted items during that duration since the first item’s emission. The debounceWithSelector operator throttles the source Observable by applying a function to each item it emits, this function generating an Observable. 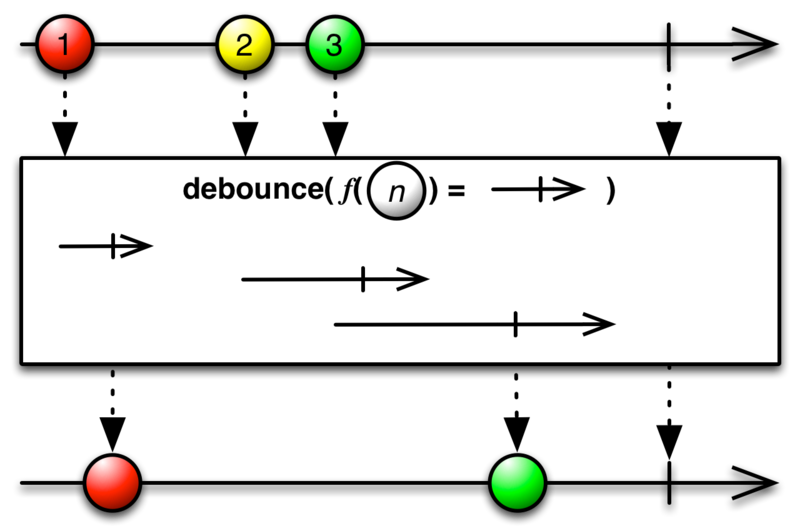 If the source Observable emits another item before this newly-generated Observable terminates, debounce will suppress the item. RxPHP implements this operator as throttle. Returns an Observable that emits only the first item emitted by the source Observable during sequential time windows of a specified duration. If items are emitted on the source observable prior to the expiration of the time period, the last item emitted on the source observable will be emitted.